Accidentally conceived in July 2013 at a small, sweaty Comedy Store open mic to avoid a comedian fistfight, insult-joke competition Roast Battle has since become a global phenomenon. Taking cues from two seemingly divergent insider traditions – Friars Club roasts and urban rap battles – the show melded both into a mainstream format accessible to anyone who dared take the stage. The rules were simple: No subject was off limits, original material only, and at the end of the battle, competitors hugged. Equal parts blood sport and personal catharsis, the show instantly caught on with performers, industry members scouting the next big thing, and audiences who preferred their punchlines off-color. As host and referee, Brian Moses assembled a zany cast of supporting characters including revered Roastmaster General Jeff Ross, who was hooked from his first night. Ross gave the show instant legitimacy. He also brought his celebrity friends along to judge. Tastemakers like Judd Apatow, Jim Carrey, Jason Reitman, Dave Chappelle, Jimmy Kimmel, Snoop Dogg, Sarah Silverman, Seth Rogen, and John Mayer counted themselves among Roast Battle’s devotees. The show caught early breaks at the New York Comedy Festival and South by Southwest. Just as a TV deal seemed inevitable, tensions rose and egos flared. Founders squabbled over ownership rights. Factions formed. Friendships were irrevocably broken. But for the creators and competitors who believed Roast Battle’s potential was bigger than the sum of its (often raunchy) parts, freedom of speech was more than a political talking point. It was everything comedy’s most enduring legends fought for since the advent of brick-wall backdrops. Five years since its inception, Roast Battle remains the most adventurous, influential comedy show in the world. Imitators exist in every city with a local comedy scene. In addition to three stateside seasons on Comedy Central, the TV brand has expanded to South Africa, Mexico, and the U.K. The latter even became Comedy Central U.K.’s most-watched series of all time. Yet despite the growing pains, the L.A. original stubbornly retains its gritty, underground spirit, reaching capacity weekly without a lick of advertising. With on-the-scene photos by Troy Conrad showcasing the venues, competitors, riotous cast of characters, and celebrity judges this “Verbal Boxing” and “Fight Club for Comedians” has welcomed along the way, longtime comedy journalist Julie Seabaugh’s Ringside at Roast Battle chronicles the emergence of a new fourth pillar of live comedy. From the coming-together of the principal players to the continuing influence the show will wield in years to come, the book explores the organic diversity, DIY nature, and politically-charged atmosphere encouraging a new generation of comedians to laugh in the face of tragedy. "It's rare that we get a document of a comedy movement or scene as it happens. 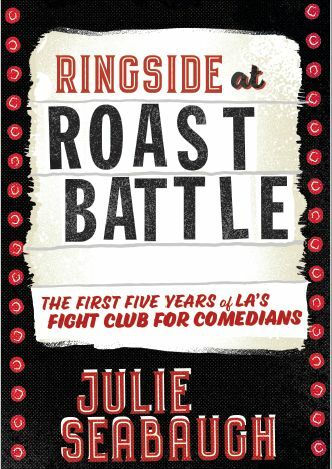 Julie Seabaugh's Ringside at Roast Battle is that rare document." "Julie Seabaugh has turned many late Tuesday nights at The Comedy Store into a brand-new book documenting the rise of Roast Battle from open mic experiment in the Belly Room to Comedy Central TV series and countless official and unofficial versions in comedy clubs around the world. With dozens of pages of exclusive photographs from Troy Conrad, Ringside at Roast Battle makes you feel as if you’ve been there all along, too."